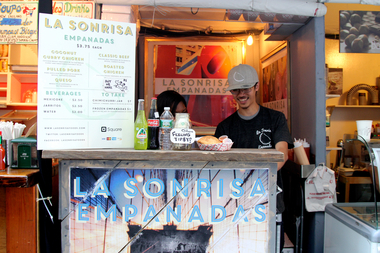 La Sonrisa Empanadas makes classic flavors like beef and variations like coconut curried chicken. GARMENT DISTRICT— Lunch options just got broader in Midtown. A food market with international cuisines will open on Broadway between West 39th and 41st streets on May 4 — slinging classics and cutting-edge street food, from authentic arepas and arancini to cross-pollinated creations like crab cake empanadas and the ubiquitous Korean taco. The UrbanSpace Garment District market's 37 vendors will be open daily from 11 a.m. to 9 p.m. and will run until June 14. Newcomers this year include Kelvin Slush Co., which makes ginger and tea-flavored slushies mixed with caramelized pineapple and fresh mint, and Yankee Doodle Dandy's, which serves American fare with a "Colonial Williamsburg meets Williamsburg" concept from a winner of Who Wants to Be A Millionaire. TOUM will return to the market with Lebanese pizza, and there will be slow-braised short ribs sandwiches from Mayhem & Stout. The startups will open up alongside outposts from established city favorites like Red Hook Lobster Pound and Momofuko Milk Bar.